I write this during an all-to brief respite from a month full of a travel and a busier one on the horizon. During September I found myself traveling from the World Methodist Council’s headquarters in the United States to Crete, Greece for a Central Committee meeting of the World Council of Churches (I am a member of the Executive Committee) then to Johannesburg, South Africa. It was a breathless and busy few weeks spent reestablishing connections with friends old and new, all in the name of the work of the World Methodist Council. When I discuss my work with the Council, one of the most important things that I can stress is that our work isn’t just the ceremonial duties and officiating that a person imagines; instead my goal is to make good on all of the work that the Council began in Durban, South Africa last year. At last year’s World Methodist Conference, the Council approved a resolution calling for Swaziland’s government to allow an open and honest dialogue with its citizens in order to find a lasting and sustainable solution to the economic crisis and questions of the suppression of free speech in the country. The resolution was a call to both those that were suffering in Swaziland as well as a challenge to both the Council and the Member Churches that we cannot sit idly while our brothers and sisters are not allowed to live with the dignity of self-government. In September, I visited Swaziland as a guest of the Methodist Church of Southern Africa (MCSA), who was holding their Annual Conference in the city of Mbabane. There I met, along with representatives from the MCSA, the Right Honorable Prime Minister, Dr. B.S.S. Dlamini to follow up on the Council’s resolution and to see if the country is making positive steps towards addressing the concerns of the Council. Prime Minister Dlamini received our resolution and assured us that our concerns would be addressed by the government. This meeting was a short one, but it is a sign that the Council is not a body full of ceremonial resolutions with no follow through; instead we are a dynamic body actively campaigning for justice. Keeping with this philosophy, in October I will find myself in Israel and Palestine, for the opening of the Methodist Liaison Office in Jerusalem. This trip gives me an opportunity to follow up on the resolution passed at the conference in Durban calling for a two-state solution for the conflict between Israel and Palestine, it also allows a moment to meet with the people in the region to express our hopes for a future filled with justice, peace and an improvement of the quality of life for all of the citizens of this troubled region. The situation in Israel and Palestine is a tenuous one, filled with emotion and anger from all invested parties. I’ve been told that even the act of referring to Palestine as its own entity is a controversial one, but the one thing that cannot be thought of as taboo is that all of the stakeholders in the region are entitled to a life with dignity and a chance to live, learn and grow as free people without fear. 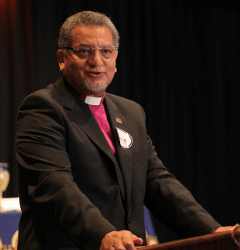 The World Methodist Council wants to be part of the process for building a Just Peace, and we hope that the lessons of our spiritual father John Wesley can soothe a troubled people. October is a busy month and the work of peace and justice can make the body weary, but I assure you that though my eyes may grow heavy at times and my body tired, my soul is overflowing with confidence and optimism that the work of the World Methodist Council is securing a better future for our worldwide family.